McGILL, George, a Senator from Kansas; born on a farm near Russell, Lucas County, Iowa, February 12, 1879; moved to Kansas with his parents, who settled on a farm near Dundee, Barton County, in 1884; attended the common schools; graduated from Central Normal College, Great Bend, Kans., in 1900; studied law; admitted to the bar in 1902 and commenced practice in Hoisington, Kans. 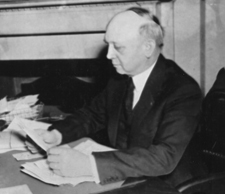 ; moved to Wichita, Sedgwick County, Kans., in 1904 and continued the practice of law; deputy county attorney of Sedgwick County 1907-1911, and county attorney 1911-1915; elected on November 4, 1930, as a Democrat to the United States Senate to fill the vacancy caused by the resignation of Charles Curtis; reelected in 1932 and served from December 1, 1930, to January 3, 1939; unsuccessful candidate for reelection in 1938 and for election in 1942, 1948, and 1954; chairman, Committee on Pensions (Seventy-third through Seventy-fifth Congresses); member of the United States Tariff Commission 1944-1954; resumed the practice of law in Wichita, Kans., until his death in St. Francis Hospital on May 14, 1963; interment in Pawnee Rock Cemetery, Pawnee Rock, Kans. McCoy, Donald. George S. McGill of Kansas and the Agricultural Adjustment Act of 1938. Historian 45 (February 1983): 186-205; Shockley, Dennis. George McGill of Kansas: Depression Senator. Ph.D. dissertation, Kansas State University, 1986.